Follow up appointments are scheduled only on Tuesday, with new visits on Tuesday or Thursday afternoons. The clinic meets every Tuesday afternoon, with the exception of major holidays. To maintain the comprehensive care we strive for, we need to be reimbursed by your insurance for the services we provide. Therefore, please bring your current insurance card and any updated insurance information with you when you come to see us. It is your responsibility to obtain any referrals or pre-authorizations you may need. Please call you insurance provider at least 2 weeks prior to your scheduled visit and make any necessary arrangements. Please call in advance for rescheduling and cancellation so that someone else can fill the appointment slot. The offices are located on the 5th Floor of Harkness, 180 Fort Washington Avenue. The building is wheelchair accessible. 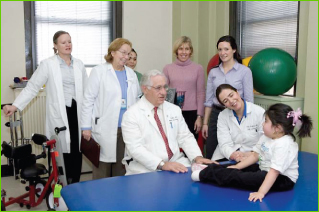 Patients must have their insurance card and any necessary referrals or pre-authorization, as well as medical information from the referring physician or any physician involved in child's treatment. Please make arrangements to have any medical information from other physicians faxed to the center prior to the appt. Fax- 212-342-2893 ATTN: Lianna Piccarillo. If you have arrangements to meet with a neurosurgeon or orthopedic surgeon during your visit to the clinic, please make sure to bring a recent set of x-rays along with you. Depending on what day you are scheduled to come in visits can range from 2-3 hours. Please bring a snack or anything necessary to make the visit comfortable.